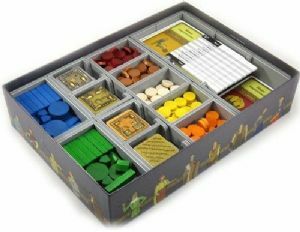 This insert is designed to be compatible with Agricola, both the original version, and the revised 2016 version with the wooden animeeples. The design provides both efficient storage and improved game play. Many of the trays can be utilised during the game, and they greatly aid set-up and clear-away times. The boards and player boards act as a lid on top of the trays. Note: when combined with the revised 2016 version of the game there is space for all cards to be sleeved. When used with the original version of the game there is space for two-thirds of the cards to be sleeved only. This is an exception to our general rule of always having space for sleeved cards. Please note that this insert has been designed to be compatible with the Z-Man Games version of Agricola and fits boxes sized 7 x 22.5 x 31.5 cm. Some versions of the game have slightly lower boxes and in this case the lid will not close fully flush when the box is fully loaded.